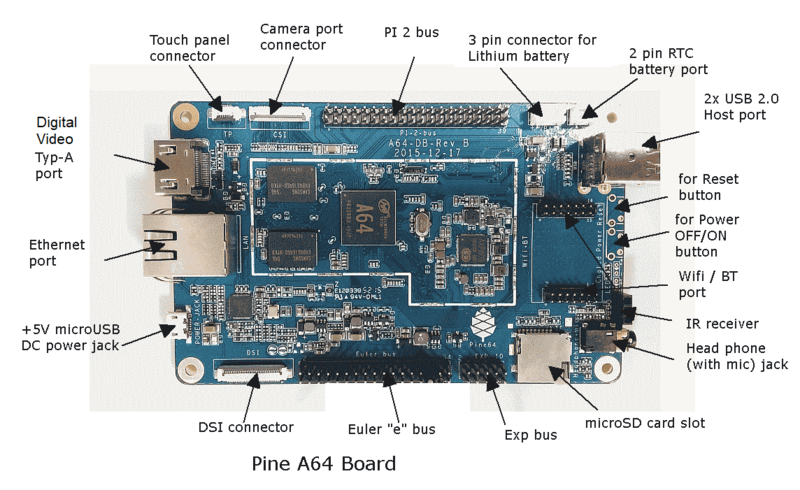 I can see that Pine64 supports himax 5mp camera module. Is it possible to have more megapixels camera option? I saw on himax website they have a 13mp image sensor too (HMD131) can Pine64 support it? I am not able to figure out whats the exact difference between HM5065 and HMD131 as I am not an electronics guy! (01-13-2016, 09:50 AM)Sasank Wrote: [ -> ] I can see that Pine64 supports himax 5mp camera module. Is it possible to have more megapixels camera option? I saw on himax website they have a 13mp image sensor too (HMD131) can Pine64 support it? I am not able to figure out whats the exact difference between HM5065 and HMD131 as I am not an electronics guy! Currently the SoC chip use in Pine A64 accept the camera resolution up to 5Mpixel, we are currently explore whether able to go higher. We need to explore whether able to support more than 5Mpixel possibility before able to goes for another step of identify camera sensor such as Himax HMD131. What is the status of the camera module, when will it be available? According to https://www.kickstarter.com/projects/pin...ts/1469130, the camera is 5 megapixels, and it will be $15.99 for kickstarter backers during the initial backerkit stage and $21.99 normal retail price. I assume at this point, it may be Android only for the initial release. Hopefully Linux will get support for it in time. Could I use an USB camera on android as standard main camera? For the camera module to work, it requires Linux kernel support. If it is indeed the HM5065 (5MP), then a google search shows some kernel files. If you search around, there are not many options for camera modules (CSI interface). Hi, does anyone know if we can attach more than 1 camera module into PINE64 ? (02-22-2016, 08:55 PM)mengchoontan Wrote: [ -> ] Hi, does anyone know if we can attach more than 1 camera module into PINE64 ? Well, there is only one camera port on the Pine (top left), so unless that port can be divided between multiple cameras, I would probably say only one camera can be attached via the camera port.